For the first time I flew to South America, more precisely to central Colombia. The atmosphere of the Quindío region is magic and the wild nature very impressive. 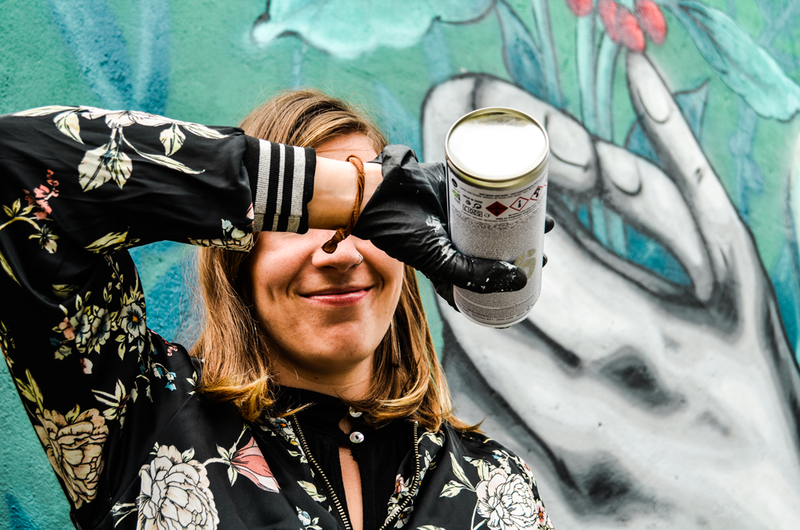 I was invited amongst other local and international artists to paint as part of the CapFest festival organised by LisergicoLab, and supported by the region and the Alliance Française. Firstly we settled for the small town of Genova located high up in the mountains. With a small group of artists we painted the houses of the local inhabitants, who were enthusiastic about the city’s first murals. My design represents the cropped face of an old Colombian man, which interacts with the window when open/closed. 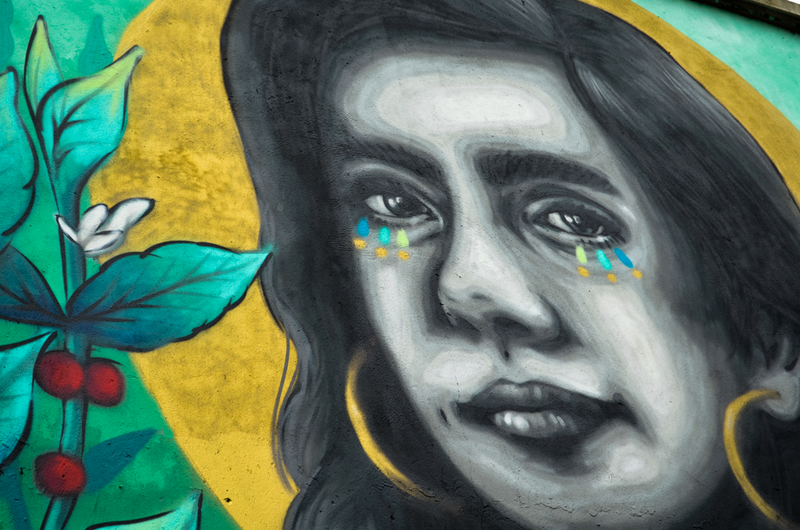 As the Quindío is one of the largest producer of coffee in Colombia, this is the theme I picked for my second mural located in the city of Armenia. More precisely it focuses on the notion of “Chapolera”, who represented the strong and beautiful paysant woman working in the fields. 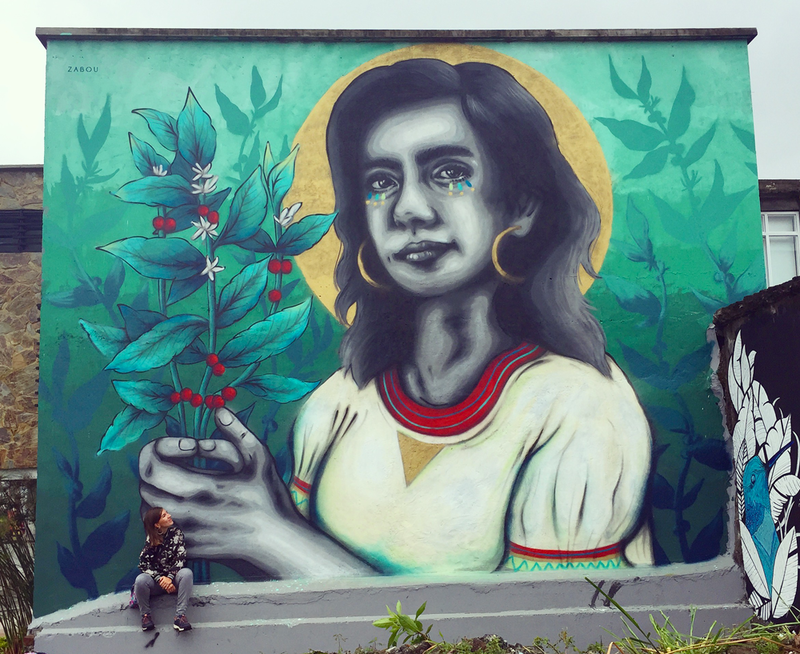 My mural is composed around a Colombian woman with a fierce look and the bunch of coffee plants she is holding. During the last couple of years I have been repainting multiple times the side wall of the The Bell, a friendly pub in East London. The structure of the wall is composed of various frames and half columns which make it complicated to work with, I have to be creative every time to adjust to the space. 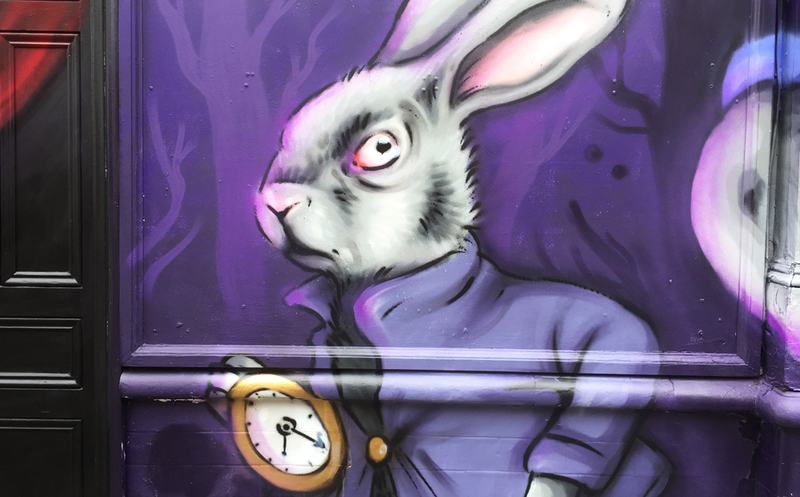 The theme selected for this new mural is ‘Alice in Wonderland’, a story I use to read when I was little and that I still appreciate greatly. 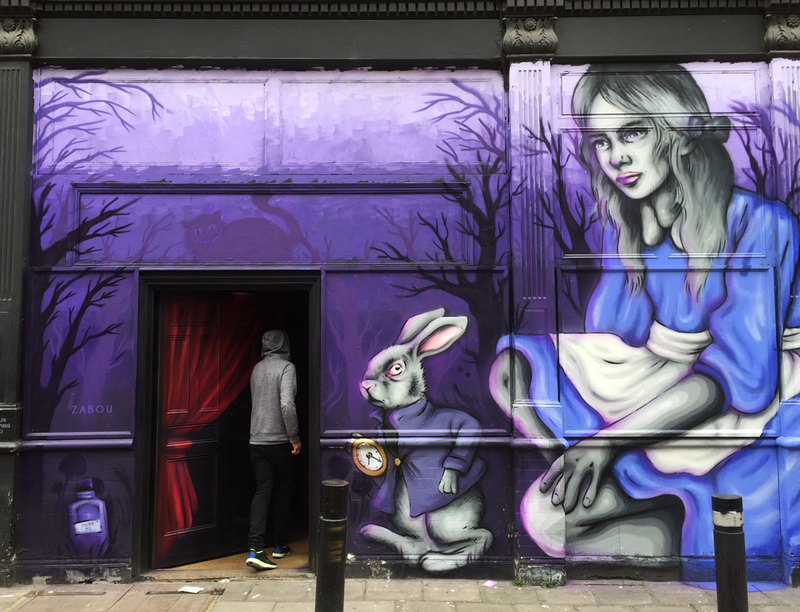 The entrance door of the pub is being used as the door where Alice goes through to enter Wonderland, following the White Rabbit running away in fear of being late. 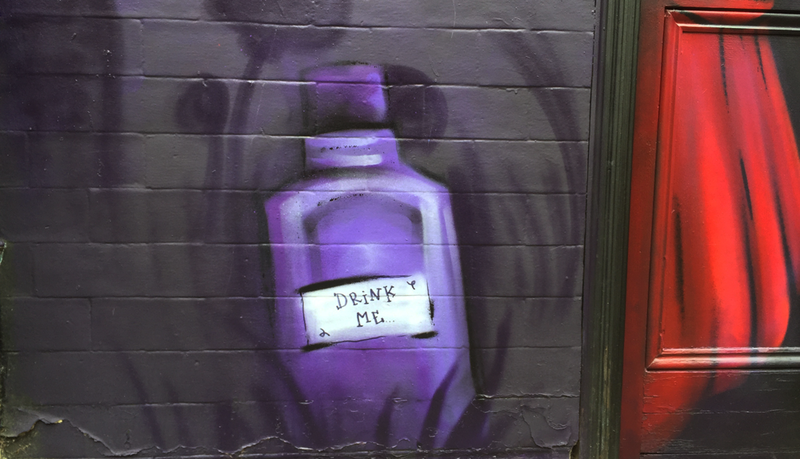 On the left side, lays a small bottle with the words ‘Drink me’. 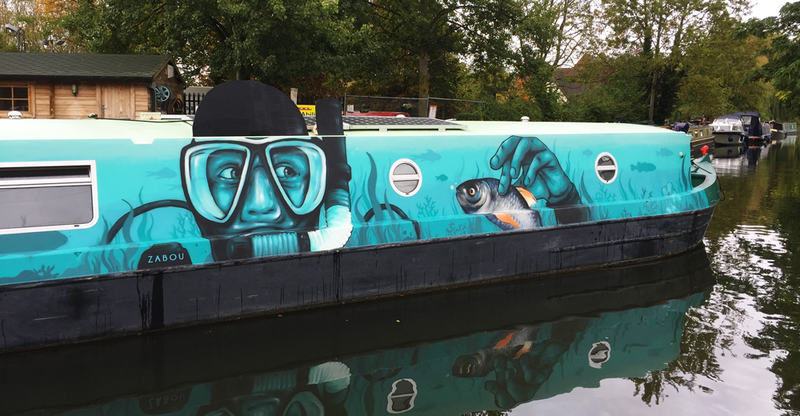 This year I’ve explored some new surfaces, I painted a rooftop a few months ago and I’ve just completed a mural on a large canal boat. The artwork depicts an underwater scenery with plants, fishes and a diver exploring the deep waters. The diver is seen holding a perch with surprise, while nearby a pike is chasing a rudd. The boat will be travelling near and across London over the next few years so you may be able to spot it!